The Partnership for Aflatoxin Control in Africa (PACA) aims to provide consistent coordination and coherent leadership to the continental efforts on aflatoxin control. The Meridian Institute has received $19.8 million in new funding from Bill & Melinda Gates Foundation, and $1.6 million USD from the United Kingdom’s Department for International Development (DfID) to support the Partnership for Aflatoxin Control in Africa (PACA). Through the leadership of the African Union Commission (AUC), and with interest from African and other governments, Regional Economic Communities, the private sector, and civil society leaders from across Africa, a comprehensive, Africa-wide approach to aflatoxin control is being established. This partnership will complement efforts to help small farmers lift themselves out of poverty by advancing projects to control aflatoxin contamination, improve food quality, and increase farmers’ access to markets. Aflatoxin is a naturally occurring, but highly toxic, substance caused by fungi. The toxin is linked to liver disease and cancer and associated with immune-system suppression, growth retardation, and death in both humans and domestic animals. PACA aims to adapt proven solutions, and identify new ones, that will work for smallholder farmers in Sub-Saharan Africa. Comprehensive solutions will be developed, addressing the health, nutrition, trade, and agricultural impacts of aflatoxin. Solutions will include effective measures to control aflatoxin along the value chain, from crop production to processing, and food preparation to consumption. For instance, native strains of beneficial fungi have been shown to dramatically reduce the prevalence of aflatoxin in the field and in storage. Proper drying and storage can help further control aflatoxin. Many other measures can be taken to reduce aflatoxin exposure to local consumers and improve opportunities to sell aflatoxin-safe crops to markets, but measures need to be supported by appropriate policy and regulatory actions. It is expected that comprehensive and feasible solutions being developed for the African small farmer context will also be useful for other regions where aflatoxin is a problem. 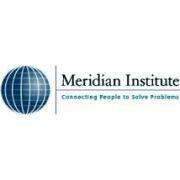 Founded in 1997, the Meridian Institute is dedicated to helping people involved in society's toughest issues solve problems and make informed decisions. At Meridian Institute, they design and facilitate collaborative solutions to some of society’s most complex and controversial issues. In addition, Meridian offers expert administrative and meeting logistics services, as well as the creative and appropriate application of information technology tools, to support the projects. Meridian Institute helps people solve problems, make informed decisions, and craft solutions to address society’s most complex and controversial issues. They accomplish this by designing and applying collaborative approaches, including facilitation, mediation and strategic consultation. Meridian’s professionals have decades of hands-on experience working on these topics. They bring objectivity to controversial and contentious topics, advocating only for an outcome based on collaborative problem solving. The people they work with value the roles as neutral third parties who encourage fairness, inclusiveness and respect for diverse viewpoints. Meridian Institute provides information technology services in support of the projects. Applications of information technology are tailored to meet the communication, information, and data management needs of the clients and projects. With these innovative tools, they can design the most appropriate and cost-effective strategy for meeting a project’s objectives, using both online and traditional face-to-face settings.